We admit, you normally won't find us repping the red, white, and blue outside of yearly Fourth of July parties, but dudes, this new shirt from Jacks & Jokers is just too fun to ignore. If you're not familiar with the homegrown brand (its offices are on the Upper East Side), look no further than a deck of cards — the line's athletic wearables are inspired by the what else — jacks and jokers featured on historic playing cards. The newest piece in the collection is all kinds of patriotic — you know, the kind of country love that makes us yearn for Memorial Day not just because this miserable weather will finally be over. Pledge allegiance, then, to J&J's Flag King tee, fabricated in a rich navy blue with the stars and stripes flying boldly over the chest. (Doesn't it remind you of those so-good, old-school Ralph Lauren shirts from the mid-'90s?) Sure, it's technically mens-only, but we're tossing the rules aside and saying it's perfect for you and your man. Isn't sharing what America's all about? 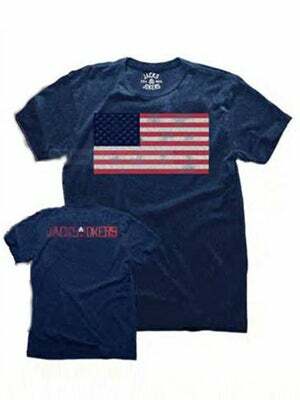 Jacks & Jokers Flag King T-Shirt, $60, available at Jacks & Jokers.